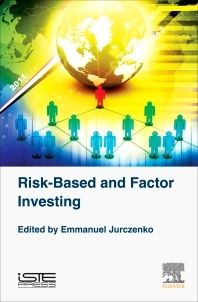 This book is a compilation of recent articles written by leading academics and practitioners in the area of risk-based and factor investing (RBFI). 4: Diversifying Risk Parity: In Today, Out Tomorrow? 6: Risk-Based Investing but What Risk(s)? 11.2 Low volatility or low beta? 18.5 Is risk premia allocation inherently superior to asset-class allocation? 19.3 Why combine multiple factors? Emmanuel Jurczenko is Associate Dean and Professor of Finance at Ecole Hôtelière de Lausanne, Switzerland. His research focuses on portfolio and risk management with a particular interest in risk budgeting, factor investing, and public and private equity real estate investments. Prior to joining Ecole hôtelière de Lausanne, he worked for ABN-AMRO between 2000 and 2006 as head of quantitative analysts, where he was in charge of quantitative fund selection. Mr. Jurczenko has written numerous articles which have been published in academic and practitioner journals. He holds a Ph.D. in Economics from the University of Paris 1 Panthéon Sorbonne in France.